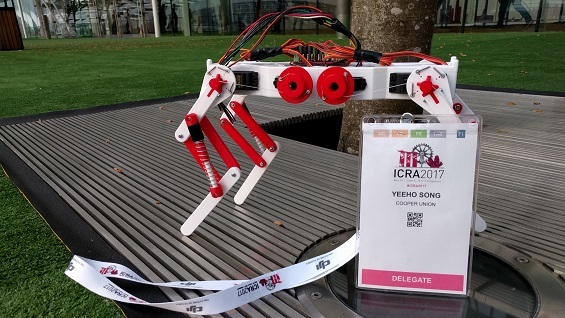 Professor Dirk Luchtenburg and ME student Yeeho Song (ME'17) are co-authors on a paper titled "Using Compliant Leg Design for Impact Attenuation of Airdrop Landings of Quadruped Robots", published in the Proceedings of the 2017 IEEE International Conference on Robotics and Automation (ICRA), Marina Bay Sands, Singapore. Most airdropped cargo use a combination of one or more parachutes and an impact attenuation system to land safely. The latter adds cost, weight and complexity. 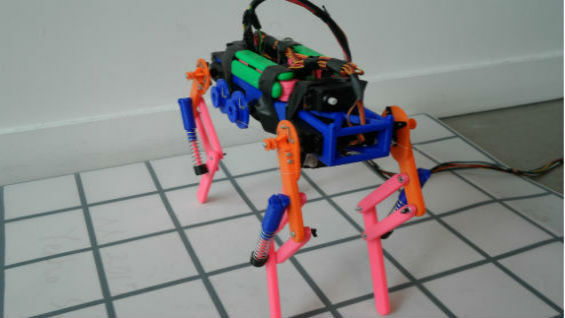 However, by using their legs for impact attenuation, airdropped quadruped robots may avoid the need for such a system. In this paper, various leg configurations for attenuating impact of airborne landings were studied and tested. Using simple lumped element models for simulation and analysis, a quadruped robot with a three-segment leg was designed and built. This model was validated with experiments with a small scale 20 cm-tall test robot. During the experiments, the test robot experienced 7.7 × 10 m/s2 or 7.9 g-acceleration when dropped from height of 37.85 cm. This result is much better than the result of 1.4 × 102 m/s2 or 14.7 g-acceleration when dropped at 10% of the original height with the same robot equipped with rigid legs. Such compliant leg design could be potentially used for impact attenuation of airdrop landings of robots five times larger.